This variously attributed quote was most probably made originally by Benjamin Disraeli. His point was to highlight the use of numbers in an argument, the further use of statistics to bolster weak arguments and then the ultimate disparagement of statistics themselves, particularly if those statistics don’t fit the correct side of the argument. The debate over the MMR vaccine sprung from one single scientific paper that spawned a million column inches, months of debating hours and possibly even the death of some children. Everyone has an opinion. Yet eight years later the study has been totally discreditied and Dr Wakefield, the first author has been struck off for research “issues”. Have you actually read the paper? Did you know there were only 12 apparently random children in the study? And that only 8 had the histological change that allegedly was the “cause” of autism itself becoming clinically apparent within 6 days of the vaccination. Now, what was your opinion on MMR vaccination again? Currently, the hot topic on the lips and legal pads of medical managers everywhere is “The Surgical Checklist.” Everyone has heard about it particularly how a simple list is hugely reducing surgical complication and even death rates across the world. Have you actually read the paper? What do you think about the potential for bias in the data collection (see results, not method)? How many patients actually had the checklist applied? What does the “checklist” actually comprise of? Save for the list, are there any other particular changes to care that may have affected the outcome? How do you think a simple surgical checklist on its own actually reduces the rate of complications such as myocardial infarction, pulmonary embolus and ventilator requirement? Or is it perhaps something else affecting results? Importantly for hospitals trying to prevent “wrong side surgery”, what evidence does the paper provide for reduction in this problem? Is the reduction in death rate statistically significant? The newspapers are particularly hot for this topic not the least because of the highlighted resistance of surgeons to this change. The fire of this debate is fuelled additionally by the age old antagonisms and prejudices particularly of managers and patient groups. A small sample of that debate can be found in the comment section here. It is not supportive of the medical profession. Perhaps we could hand out some ladders of inference to help calm things? Now read just about any news article or pronouncement from management on the issue. 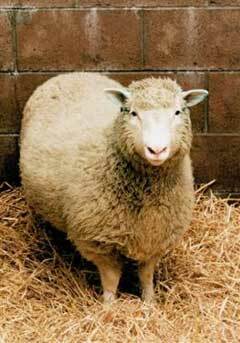 Are the changes to be instituted justified by the vigour and results of the study? Can you understand why there may be some antagonism between the two groups? If you were (are) a manager, how would you approach the situation? Now I’m not against improvements in clinical care or checklists or debate, I’d just like it a bit better informed. Lies, damned lies or statistics, you decide. The hit count for this blog has now passed 1000. Reviewing the various entries I felt it appropriate to express my feelings on why I believe blogging is NOT pointless. I’m currently undertaking a part-time degree in Clinical Leadership. The value of the course is not simply in the lectures but the more open, tutorial type approach that we engage in with our tutors and each other. This is augmented by online discussion although, as a group, I don’t think we have fully bought into that idea. This discursive approach to learning is in stark contrast to my original training ( four arts) where facts are transmitted in a more didactic and Hypocratic (sic) manner as one would expect. The value of interrogation of concepts by debate cannot be underestimated. It allows for correction but also solidification in expression. Everyone has experience of management and, for my Action Learning, I have to journal my pre-understanding of the situation whether that be true, bad or influenced by concepts such as the ladder of inference. It is to be hoped that as time moves on my understanding will deepen and perhaps some negativity may be replaced by more positive stories. The truth hurts sometimes but so does perception of the truth. We could debate whether the two are in fact the same but therein lies the value of recording pre-understanding so that my journey into Clinical Leadership is documented with honesty and may be interpreted appropriately. There is no doubt that the hit counter prompts me to continue writing. I am sure if this had steadfastly remained evidence of only my Dad reading the blog on a daily basis (thanks Dad) that I would have given up. There is encouragement in this readership but as gnomechompski pointed out the value of the blog is not about seeking approval. Finally there is value in the discipline of writing. This cannot be over-estimated. So many thoughts prosper without exposure to fuller expression. They may germinate in the mind and develop into full grown plants nurtured by fleeting showers of mis-construed impressions in the fertile soil of isolation. The problem is that such plants are frequently weeds and choke the shoots of value and of clear thinking. Once these weeds are actually exposed to the gardening of preparation, writing and discussion they might be seen for what they are and either wither in the glare or are plucked by the insightful gardener and tossed onto the compost. Of course it is true that this process happens in open discussion, over coffee, in pubs and anywhere like minds gather and share ideas. My only question to you would be, do you meet and discuss such thoughts with like minds often or only in the quiet garden of your mind? Thanks for coming by, please leave more than just the footprint of passage. Make a comment, ask a question, join the debate. It adds so much. An essential part of Action Research is reflection. Clearly such reflection is personal and we must assume, accept and interrogate our understanding of this reflection in the knowledge that all of our perceptions are affected by previous knowledge and experience. This therefore gives a reflection on the action that may not necessarily be shared by others. This method of research is in stark contrast to the paradigm of logical positivism where such personal involvement is essential forbidden. This difference leads to an essential and probably defining concept within such research of recognising and detailing what assumptions are being made upon the basis of this reflection and at the same time offering personal opinion and beliefs for discussion and examination. Argyris et al. 1985 describe a ladder of inference to help develop understanding of how perceptions are developed of observable data and events such that previous experience will affect how an outcome is perceived. Clearly this is describing reality and the effects of this ladder are not to be removed merely accepted as existing. From my personal experience I was approached by a Consultant colleague and asked if I could allow him to operate on a complex case on my Thursday list some 8 weeks in advance. We discussed the matter, agreed the date, emailed the waiting list department to ensure the list was currently empty, booked the patient as the only case for the day, informed the anaesthetist and all was well. Until I received a call at 6pm the night before the list from a ward clerk saying there were four additional patients booked for the list the next day (by a booking clerk). I explained this was an error, that the major case was scheduled 8 weeks earlier and would be the only operation possible that day as had originally been arranged. 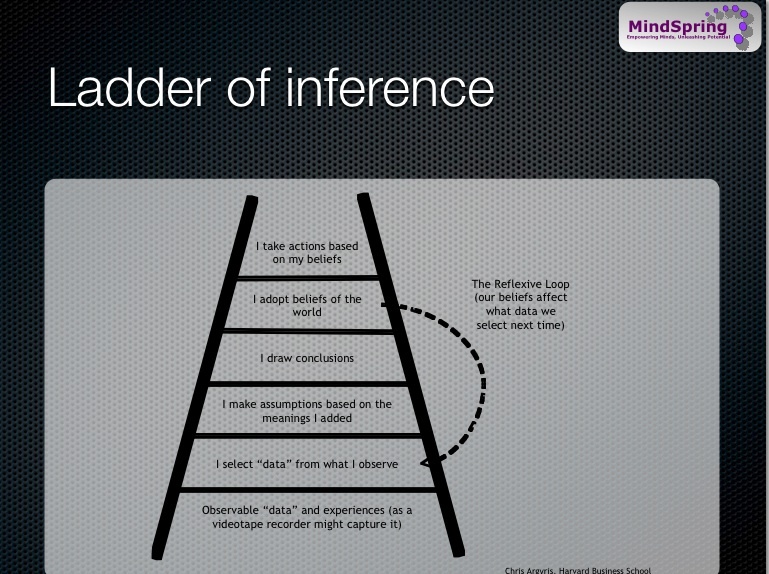 The ladder of inference is interesting and presents many possible interpretations of events. Such ladders are possibly as stable as the picture above. They clearly exists however and we all need to accept that we are all balanced precariously on our own ladders of inference before acting and responding. addition- there is a further post on this topic here.